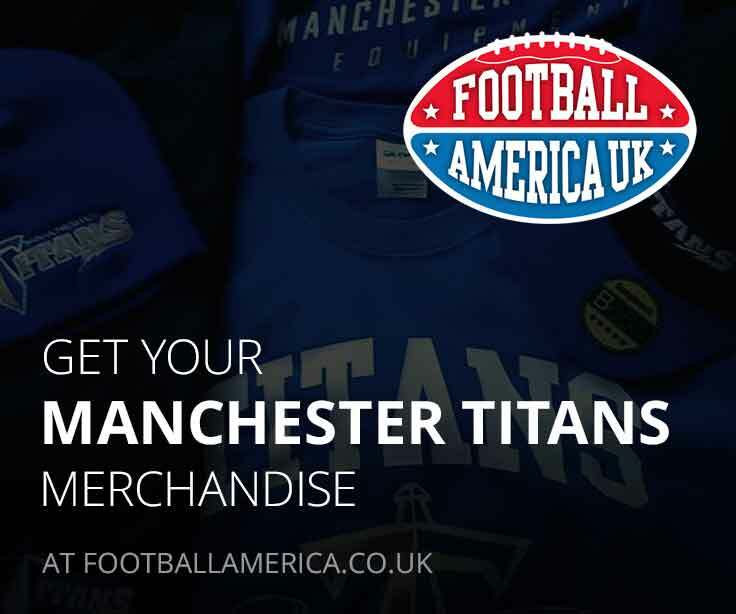 Manchester Titans Under 19’s was started in late 2009, when a group of graduating Youth players who weren’t ready to hang up their helmets. Since then they have competed each season in the British American Football Association National League. They won their first ever game with a 12-8 comeback victory against the Gateshead Senators. Past Titans Junior GB players: Mike Ainscow, Adam Carter, Sam Pollard and Sam Darlington-Smith. In 2013, the Titans had 3 Juniors attend Filton Pride and lineman Richard Flood travelled to Texas to be part FBU all Europe team. Initially under Head Coach Alan Mead the Titans struggled to get a foothold at U19 level with traditional powerhouses Lancashire Wolverines and Chorley Buccaneers dominating the North West divisions. Despite not having winning seasons, many current Titans senior team players and coaches passed through the team, Thomas Leonard, Luke Carlton (both coaches), Ainsley Battell, James Newnes, Jonathan Pan Gago to name just a few. In 2012 Connor Higgins replaced Mead as Head Coach and was at the helm for three seasons, it was, however, a similar story with the team struggling to gain a foothold and pick up wins on a regular basis. 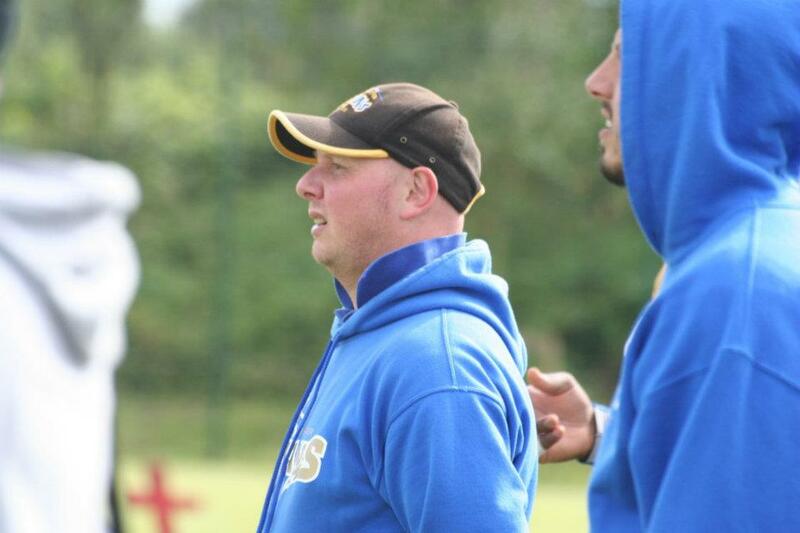 In 2015, the committee brought former Adult Contact Head Coach Phil Chapman back to the club to lead the U19 programme. With the U17 team starting to feed in players past recruitment issues were now behind the team and the foundation had been laid by Team Manager Verity Brawn over the past 5 years, Chapman brought in former Titans and GB Safety Graham Roberts to head up a new coaching team. The new regime enjoyed a winning season, finishing with a 6-2 record they came 2nd in the Northern division to the Birmingham Lions brining play-off football to the U19 programme for the first time. A quarter final hammering of Doncaster 35-0 saw the team travel to Birmingham in the semi-final where they fell 28-14. On the back of this success Titans player gained international recognition with 5 players from the team selected to represent Great Britain in two games played in Denmark. (L to R) Titans Mikey Dean, Chester Lilley, Gariq Johnson, Ryan Hulse and Bruce Sibanda. Both Johnson and Sibanda went on to earn scholarships to play American Football at university with Johnson winning a BUCS National Title with the Stirling Clansmen. 2016 brought more success a first divisional title. 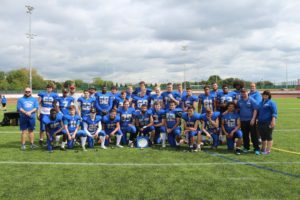 Winning every game during the regular season, including a nail-biting decider 14-12 away at Leeds Academy the Team won the Northern Division Title. Their journey again ended at the semi-final stage, this time to the East Kilbride Pirates after a 12-0 loss at home. 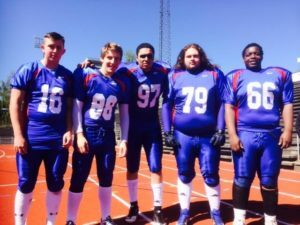 At the end of the season players Chase Johnston, Khaleel Begg, Dai’shone Spence and Josh Williams were all offered places at Filton Pride (SGS Academy) to study and play American Football full-time. 2017 sees the third year under Chapman and with more players stepping up from U17 and strong recruitment the team are primed to take the next step. A revamped division saw an expanded Northern conference containing 8 teams, although the Titans would only play 5 of them. A 5-1 regular season record saw the Titans ranked No.1 in the country on both Offense and Defense including 3 scores of 50+ and 2 shutouts. 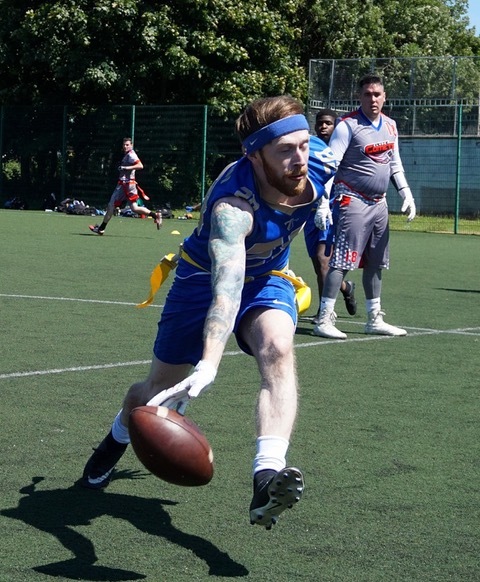 Unfortunately, a loss away at Nottingham in week 2 that the Titans would not have chance to avenge at home meant they finished 3rd and qualified for the Britbowl Trophy game. A tense game saw the Titans lead 15-0 only for their opponents, the Highland Wildcats to come back and win with a hail mary pass as time expired 18-15. 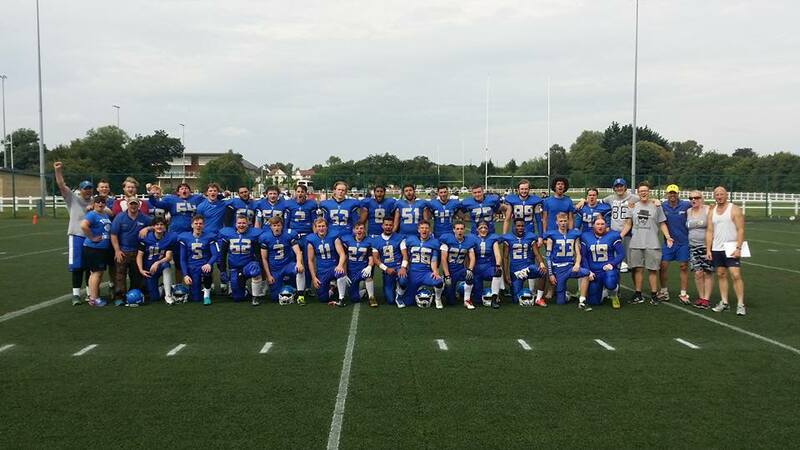 The game saw the Titans U19 team presented with it’s first ever trophy and although dissapointed the players took home BAFA medals and can be very proud of their achievements. Coach Chapman’s three years in charge have seen a regular season record of 17-3 with semi-final appearances in 2015 and 2016 and the Britbowl Trophy final in 2017. 2018 say Coach Homer move from U17 to take the helm at U19, a delayed start to the season didn’t hinder the young team containing a large number of U17 graduates in their first season at the higher age group. 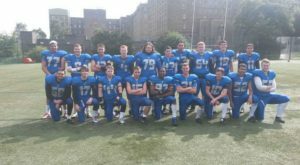 An unbeaten season followed as the Titans took the Northern Conference Championship, the highlight of the season being a 37-12 road victory at East Kilbride and a 62-0 home victory against the 2017 Britbowl Plate winner Nottingham Panthers. Into the play-offs the Titans met East Kilbride again, this time at home, a fantastic game ended 28-28 but the Titans took the win with in overtime after the defense stopped EKP on their first drive and the offer took just 3 plays to punch the ball home. 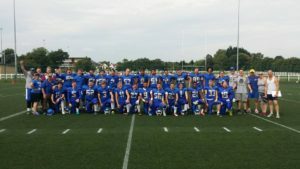 Playing in their first every Britbowl Final the Titans fell short 24-7 to the London Blitz. The season ended with 13 members of the squad making the Great Britain development squad and three members, Tom Morgan, Nathan Groom and Danlyo Blackburn being selected to represent GB in a friendly away in Holland.